So I have a (very small) shop in etsy www.etsy.com and I post things there every now and then. It makes me feel as though I am making my jewelry and yarn crafts (which I enjoy doing) for a purpose (because really how many holidays in a row can I give someone a homemade gift?). As I said it's a very small shop. A couple of weeks ago I sold a necklace I had made (not the one above that's one a friend asked me to make for her mother) it was copper chain maille it probably took me 10-12 hours and I sold it for... $9! But in reality the money wasn't even part of it, sure it was nice that my hobby paid for itself that time, but the validation that it gave me was amazing! I watched it go from: wow they bought it, to wow they liked it, to wow they liked something *I* made. All of a sudden it was as if I had been invited to the "cool" table at school. 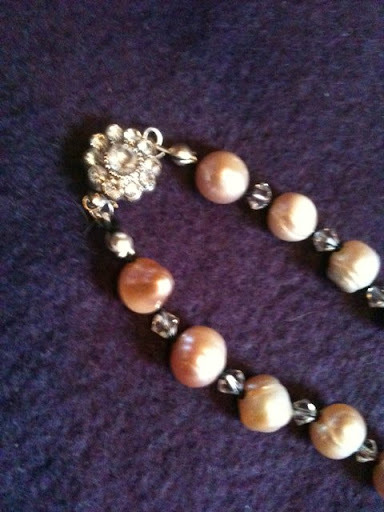 While I carefully wrapped my special necklace and blissfully brought it to the post I noticed a spring in my step. I was someone who mattered. This is silly, isn't it? I am certain that the hubster and pupster (and a few great friends) would tell you I mattered no matter if I ever sold a single thing but for me? I needed this validation to feel as though I mattered! That's awesome! I hope you pursue this hobby....it gives you joy!